For reference, a pair of the Ming chairs pictured below retails for $1,900 from 1st Dibs. Granted, these are in better shape than the ones I purchased, but for a more than 90% discount, I'll take the chips and scratches. I shared the fabrics I was deciding between in this post, and in the end I went with the Trina Turk Carmel Coastline in Jet. I love how they turned out! 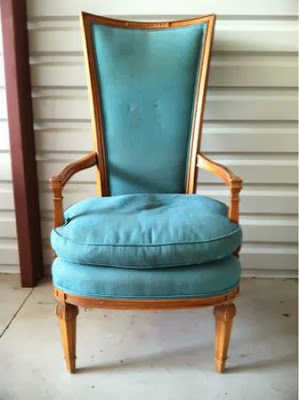 The second before & after I have to share is the "Alice & Wonderland" chair as my mom calls it pictured below, which you may remember from this post back in June. This chair turned into quite the project when I decided to refinish it myself. Now that it's done, I'm glad I DIY'ed it, but I'm honestly not sure I would do it again. WERK, y'all. For this chair, I decided to go with a dark, weathered finish and a chartreuse-ish velvet (Savoy in Spring by Robert Allen). It's definitely bolder and more dramatic than I would normally pick, but I am liking the way it turned out. My bedroom is pretty bland so it could use a little drama. Under the same philosophy of "If you give a mouse a cookie..." my mind is now turning to other ways to update my room. While I am sitting tight for the moment (and probably should stay tight until I move somewhere more permanent), I have been playing around with updating the art just for fun. I will share more in future posts (probably need to do another post dedicated solely to art I've been eyeing recently anyways), but for now I will share this mock up I made of some crazy colored art that plays on the boldness of the chartreuse in the chair. I am in LOVE with the colors in the turquoise print in particular. 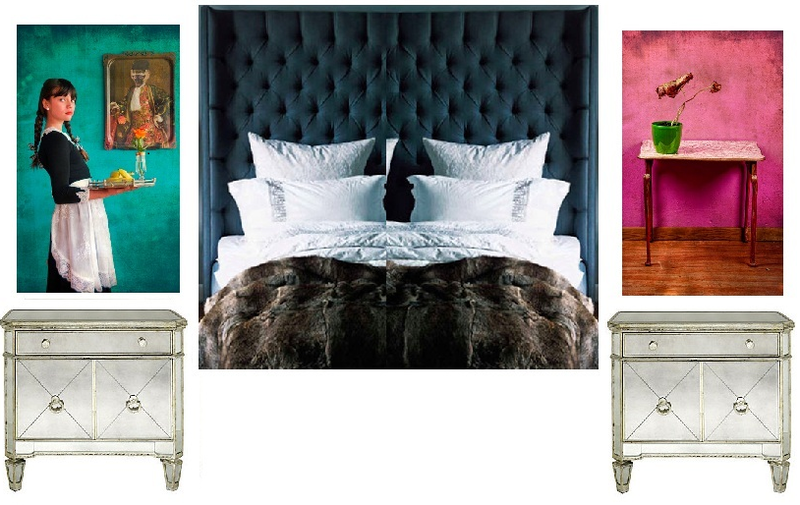 Both prints are copies of paintings by Carla Broekhuizen, which I found on Society 6. I know the mock-up above is pretty B-squad, but it was fun for me to make, and you should be expecting more of them :) Be back soon with some more art and whatever else feels worthy of sharing. Happy Hump Day!